Guess what! Today I got a fabulous phone call: it was a lovely lady from FirstCape wine telling me that I am a finalist in their competition. 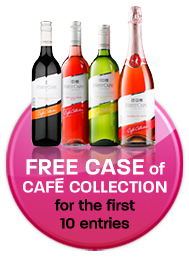 I now officially have a 1 in 10 chance of being crowned Café Collection Queen of Chat by fabby wine brand FirstCape. Now I know what you're thinking... What? But Leanne is just so shy and timid, how can this be... ok, maybe not! Yes, those of you that know me know that it can be difficult to get a word in edge ways when I'm about, whether I'm with friends, at the doctors, in work or on the train - no one is safe from my constant chatter - not even strangers. So, moving on... you're probably wondering what the Café Collection Queen of Chat is all about, right? Yes, you did see that right.... FREE WINE!!! I checked the site and no other entries had yet been added to the site. I went in to panic mode. Quick as a flash I grabbed my Flip camera and sat down to film my entry. I didn't even brush my hair or put on any lippy, never mind think about what I was going to say. I just knew I wanted to be one of the first 10 entries - who cares what it looked like, I'd never make it to the final anyway!! I set up the camera, pressed record then ran back to the sofa to sit down and begin my entry. After what seemed like 3 minutes I got up and turned of the camera... 6 Minutes... Damn! I tried again... 6 minutes 30 seconds. Every time I tried to do it I was over the time limit. Next I tried looking at the clock but I got so in to my 'chat' that I couldn't work out how many times the second hand had been round. FAIL. Eventually I managed it, I went just a little over and managed to trim the end off. I uploaded it and prayed Id be one of the first 10 entries. I was. Hoorah - mission accomplished - the wine would be mine! ...only it didn't end there, with the free case of wine. No, I've made it... Made it to the FINAL 10!!! Unfortunately it is a voting competition so I will need your help - please?!?! PLEASE VOTE FOR ME (LEANNE) JUST CLICK IN THE lITTLE CIRCLE UNDER MY NAME AND CLICK 'VOTE NOW' - SIMPLES!!! I know it's not time yet but when the time comes, I'd really appreciate it if you would click and vote! Don't worry, I'll be badgering you daily for votes so you don't forget! If I won then I'd attend an amazing event in the big smoke to be crowned and get to meet fellow Queen of Chat, Alesha Dixon. Eeeeeeek - exciting! !